When it comes to the final stages of lead generation, sometimes all your current prospects need is a little support and guidance on the forms that officially convert them to customers. 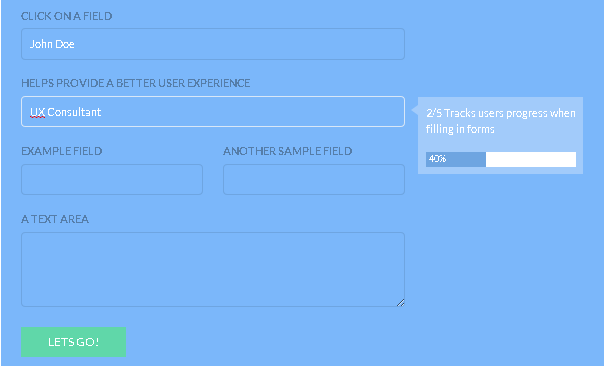 Forms can be quite cumbersome for users, so designers and developers need to take extra special care in their construction (both layout and styling), but sometimes all that’s really needed to boost conversion rates is a guiding hand. Progression.js may just provide the perfect opportunity. The jQuery plugin gives users progress updates as they complete different form fields. To get started, just include the files, give the form a unique ID, and then add a data attribute to each element that needs a step in the form progression. Then, just set the helper text for the tooltip and initiate the plugin and you’re off an running. Progression.js is being released under the MIT license and is available for download at Github.